We used to love eating chicken satay with Thai peanut sauce. Unfortunately, now that my husband can’t have any gluten, we have to stay away from this as the peanut sauce usually contains soy sauce (most brands use wheat in it). So the only we could enjoy this dish is if I cook it at home. After several tries, I finally came up with this gluten-free Thai peanut sauce and chicken satay recipe. Ever since I started making this, my family requests it all the time. I hope you enjoy it as much as we do! Place coconut oil in pan and allow to heat on medium-high. Lightly season chicken with salt and pepper. Add chicken to pan and allow to cook for about six minutes. Turn chicken over and cook for another 6 minutes or until it is no longer pink inside. Mix peanut butter, sweet chili sauce, Temari, brown sugar, and vinegar together. Heat for 30 seconds in the microwave, half power. Stir. Add water until desired consistency. Stir until fully mixed in and repeat step 4. That’s it. Just brown, mix, and serve. You can also thread the chicken strips on skewers and grill them for a tasty barbecue treat. I only lightly season the chicken because my family likes to slather on the Thai peanut sauce so the flavor of the chicken itself is irrelevant. They only care that it’s tender. Also, though broccoli is pictured above, we actually prefer eating this with French cut string beans. To complete the meal, make some Thai iced tea or grab a couple of cans from a local asian grocery store. This looks really good. I believe my family would really enjoy eating this. TerriAnn, that looks so good! I’ll definitely be trying this soon! I’m always looking for new chicken recipes! This looks awesome! Now that looks delicious! I’ve been looking for a new recipe to try. That sounds great. Love the peanut sauce. We also have issues but they are peanut, not gluten. With my son at sleep away this is the only time we can actually eat this! We have no fear of getting any peanuts on him with him out of town, so thanks for the recipe! This looks delicious! That is great for GF people too! Thank you for sharing this.I love chicken satay.Great that it is gluten free. Omg, I love peanut sauce! Can’t wait to try this recipe! Wow! That sounds beyond amazing. I love Thai food so much!! I love chicken satay! Thanks for the recipe. I want to try this for dinner one night. Love that it’s gluten free. Looks delicious. This looks tasty and I’m always on the lookout for gluten-free recipe ideas. Thanks for the inspiration! This looks very similar to a crockpot thai chicken recipe I make. I am sure its delish! This looks amazing! I always think of peanut sauce as being spicy, is that the case? Not really and I’m a total spice wimp. This just has a little bite at the end but only for the flavor and not for the heat. 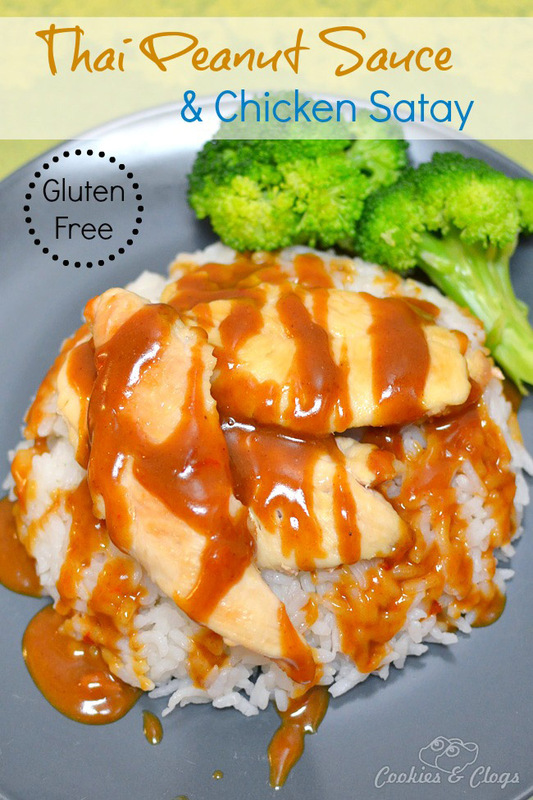 My daughter has celiac and loves Thai food so I will be making this soon. Thanks for sharing. that looks super yummy. the name alone makes it inviting. This looks really good. I only tried Thai food for the first time THIS year! I loved the peanut sauce. I love chicken and I love Thai. I cannot wait to try these~! Terri Ann, I’m coming over. The sauce, the rice, the chicken…all of it. I must have some! This looks fantastic, and photographs nice! I think the thai peanut sauce would really make this one special, and I like that it’s gluten-free for those who need it. That looks so good! I love Thai sauce- so I might just coat everything in it! Im not going to lie I am not gluten-free anything…I am just not interested in hoping on the trend. But you made this recipe look amazing…gluten-free or not this looks great! Looks tasty and super easy. I’m a sucker for anything with peanuts. That looks delicious! You know, I have never had peanut sauce! I love GF recipes. I try to eat GF all the time just for the health of it. This looks good. I love Thai cuisine. I like that this recipe is gluten free. I’ll have to try it. That sauce would be a great addition to our usual Asian menu. Thanks for sharing this recipe! HUGE fan of Thai peanut sauce! Thanks for a gluten free version! We’re not gluten free and have no need to be personally. However, I’m loving this recipe and we’ll be trying it. This sounds so delicious. I bet it would taste great over brown rice as well! What a fun recipe, I like that it isn’t something that we eat normally, so be fun to ttry out a new recipe like this! Thank you for the recipe. My son is into putting peanut sauce on everything. He is going to love this! I’m trying to maintain a gluten free diet so thanks so much for sharing this. This looks delicious and I love that it is gluten free. Now, if they could only come up with zero calorie rice. I love recipes like this. We usually try to add something different to our meal plan each week so I’ll have to share this one with my husband and see what he thinks! He loves thai so I’m sure he’ll want to try it out. It looks amazing, but I’d love your idea of putting it on the BBQ also. That looks good! Bookmarking for dinner tomorrow! Need a new way to do chicken! This just looks so delicious. 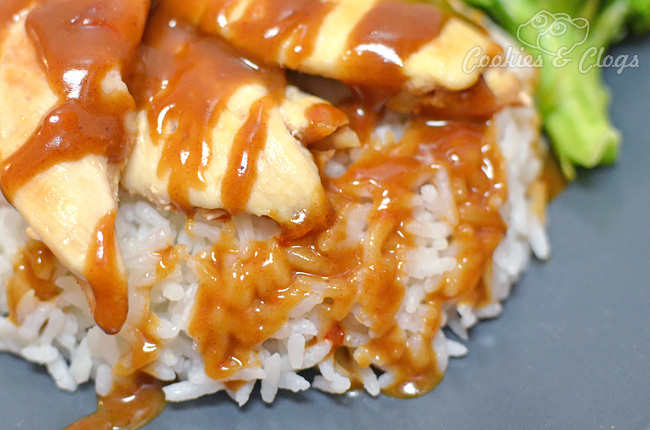 The way the chicken sits on top of the rice with the sauce, just looks so appealing to me. It’s great that you were able to change the recipe up to be Gluten-Free especially since it’s a favorite of your family’s. I’m fortunate that even despite my daughter’s lactose intolerance I haven’t had to do too much altering of what my family eats. I am a big Thai food fan and don’t get out to enjoy some nearly enough. Thank you for sharing an easy recipe that I can make at home! Thank you for this, I cooked it today, the version for me was with sweet chilli sauce and, since my boyfriend doesn’t prefer sweetness, I added hot spicy chilli sauce for his part and it tasted also great!